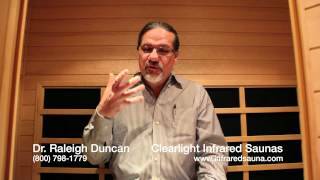 Clearlight Infrared Saunas Founder, Dr. Raleigh Duncan, Interviewed at the Longevity Now Conference Dr. Raleigh Duncan, the founder of Clearlight Infrared Saunas, discusses health, wellness and nutrition at the David Wolfe Longevity Now Conference. 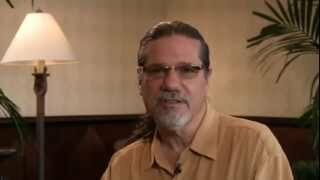 Dr. Raleigh Duncan discusses resonant frequency and how it applies to infrared saunas and detoxification. 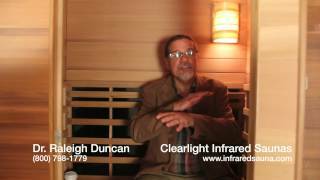 Clearlight Infrared Saunas Lifetime Warranty Dr. Raleigh Duncan discusses how to tell if an infrared sauna company actually has a full lifetime warranty. What is the relationship between toxins and cancer? -- Clearlight Infrared Sauna Mailbag Jeff from Kirkland, OH asks what is the relationship between toxins and cancer? 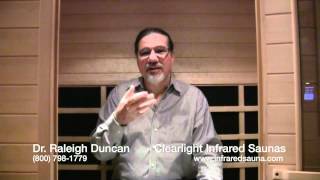 Infrared Saunas and Weight Loss -- Clearlight Infrared Sauna Mailbag Candace asks how does an infrared sauna effect weight loss. 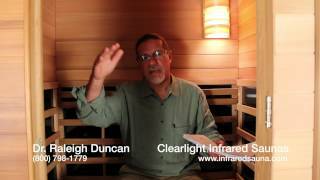 Clearlight Sauna Mailbag -- What wood is better for infrared saunas, cedar or nordic spruce? 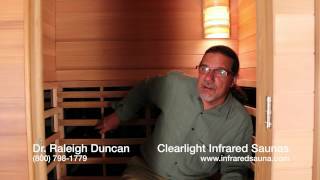 Gerald from Tampa, Fl asks what wood is better for infrared saunas, cedar or nordic spruce. How do infrared saunas help with pain? 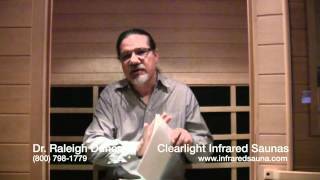 -- Clearlight Infrared Sauna Mailbag Shirley from Buena Park, CA asks how will infrared saunas help me with pain? How does an infrared sauna remove toxins? 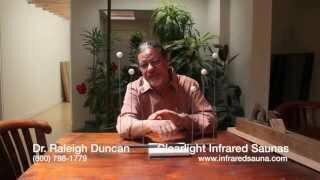 -- Clearlight Infrared Sauna Mailbag Brent from New Jersey asks, "how does an infrared sauna remove toxins from my body?" Which is better, carbon or ceramic infrared sauna heaters? 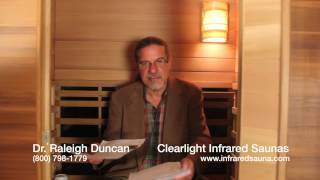 -- Clearlight Infrared Sauna Mailbag Paul from Bakersfield, CA asks which heaters is better, carbon or ceramic infrared sauna heaters? How long does it take for my infrared sauna to heat up? 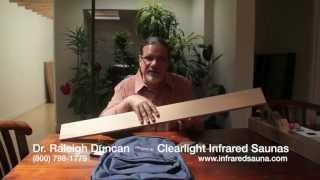 -- Clearlight Infrared Sauna Mailbag Jean from Kalamazoo, MI asks how long it takes for Clearlight Infrared Saunas to heat up?